Bertha has appeared twice in my occasional blogs about the pets. ( 21 November 2012 and 15 December 2013 – The Joy of Cats 1 and 2). 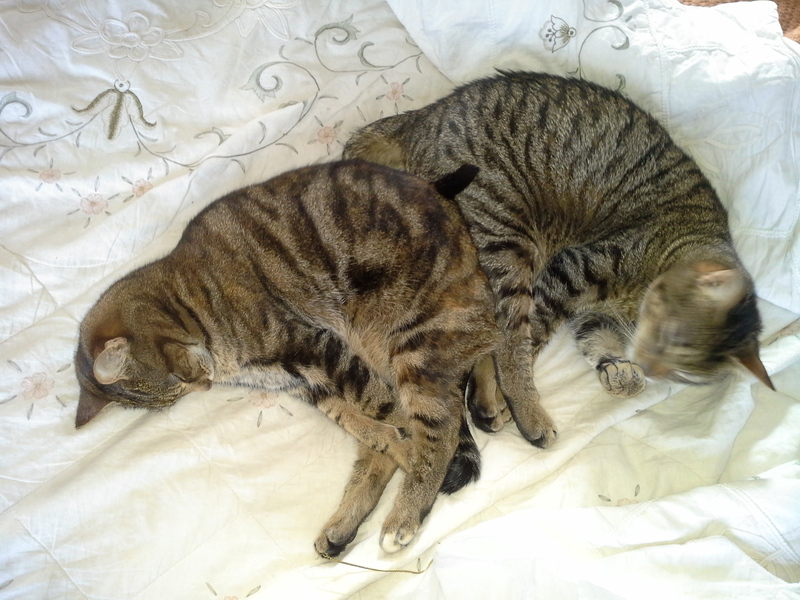 Boris and Bertha were sibling tabby kittens who entered the family in 2012. They joined a hall of tabby fame: Tomcat, Kevin, Sharon and Darren, Dolores who have cohabited with us over the years. They grew from kittenhood to maturity and remained friends with each other. Often they would curl up together for some quality sleep on my bed. When they had to go to the Cottage Cattery at Llangwyryfon they would share a two-cat pen, a lavish pad with their own beds, scratching posts and every amenity. Boris would from time to time hold Bertha firmly down and groom her face and ears, but Bertha was no pushover, she would soon send him on his way if he was annoying her. Three years old, they showed different personalities. Boris is in some ways cowardly ( he runs from the room if one sneezes loudly) but would initiate blithe chasing games with the dog, in which they would charge at full pelt around the house. He would always present his rear for dog inspection and rub up affectionately against him. Bertha was extraordinarily tolerant of babies, and would lie purring as small hands rummaged her fur like an old coat. Boris would swiftly depart at such treatment. So it was a bolt from the blue to step out my back door last week to feed the chickens and find Bertha, dead and stiff just outside. 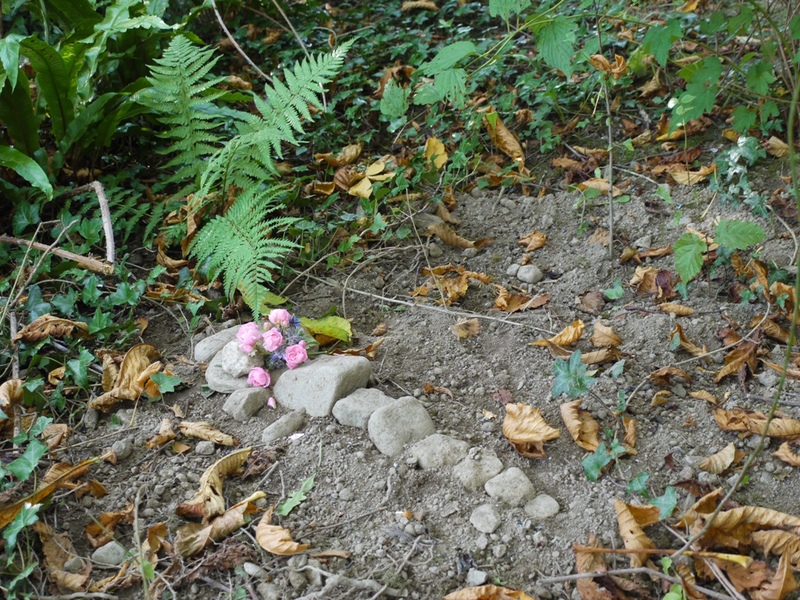 She didn’t ever go far from the house, and her dead body showed no sign of trauma whatever. So astounded was I that I took her for a post-mortem, and the vet could find no cause of death either. We were left with some lame hypotheses – had she had a blow to the head causing brain injury? 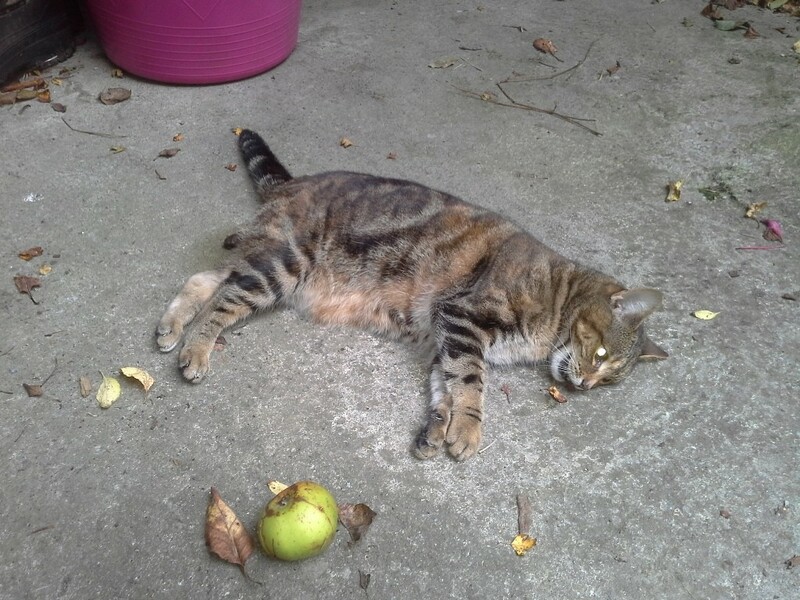 It is the time of year when Bramley apples crash suddenly from the tall trees. Or was there dire significance in the sudden attack of frantic whirling and biting herself which she had shown for a minute of total craziness the night before she died? Bertha aged 3 years, unexpectedly deceased. We shall never know, but I buried her under the fir and the horse chestnut where she joins Homer the previous Lhasa Apso, and Sharon, sister of Darren, who was cut down by a car in 1997. Boris and Otto have been unmoved by the death. Indeed Boris if anything is even more affectionate. He has brought in an enhanced supply of mice and voles, he still flirts with the dog, and is even more inclined to join us on the sofa of an evening. 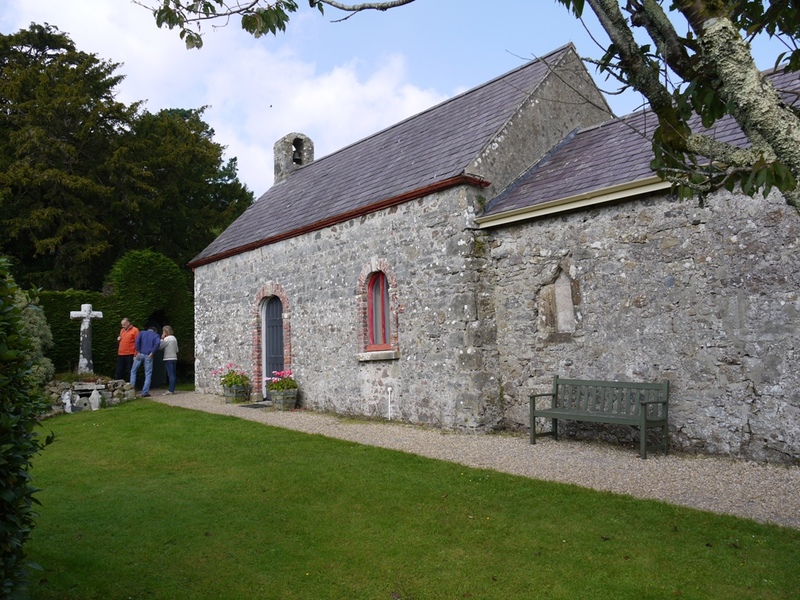 There is a small upland church in the middle of nowhere near Devil’s Bridge. It is called Ysbyty Cynfryn. Its extreme antiquity is suggested by the huge standing stones which rear here and there within the structure of the circular churchyard wall. Its yews are also of considerable age. They are spreading English yews, not the upright fastigate Irish yews so popular since the early 19th century. 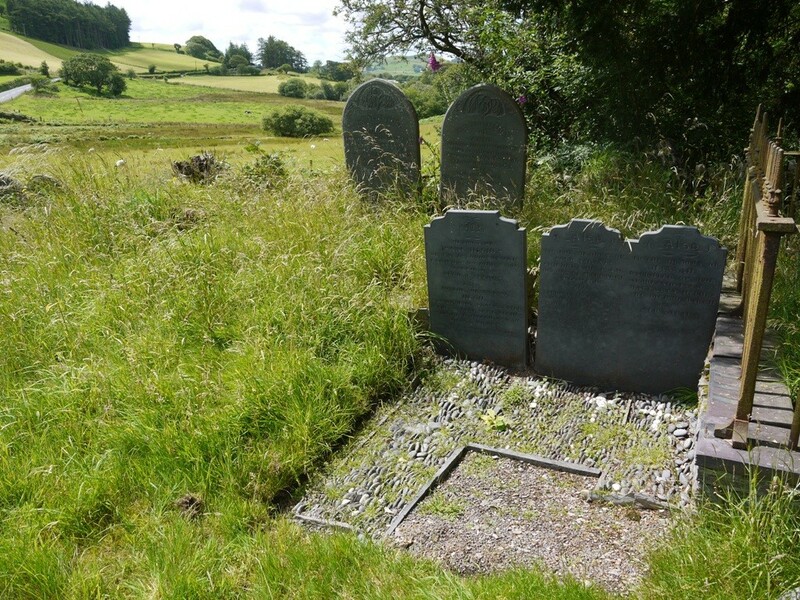 Possibly it is best known for the grave of four quadruplets born to Margaret Hughes in a cottage called Nant Syddion on 17 February 1856. Poor woman, it is hard to imagine her suffering. Three of her four babies died within three days of birth, the fourth, a boy, after a week. The brief lives of Margaret, Elizabeth, Catherine and Isaac are recorded on a single gravestone. In March there were further deaths: her son Hugh aged 5 died on 1 March, her husband Isaac, aged 32 on 6th March, and her daughter Hannah ( aged 3) on 10th March. These later deaths are believed to be as a result of infectious disease – un-referenced histories attribute them to various epidemic diseases: Typhoid, Typhus, Cholera, Smallpox and Influenza. Multiple births seldom survived at this time. Nowadays treatments are available to improve the function of immature lungs and tubes can be inserted for artificial feeding. In the 19th century a baby who couldn’t suckle simply wouldn’t live, and it looks as if this was the fate of Margaret Hughes’ four babies. 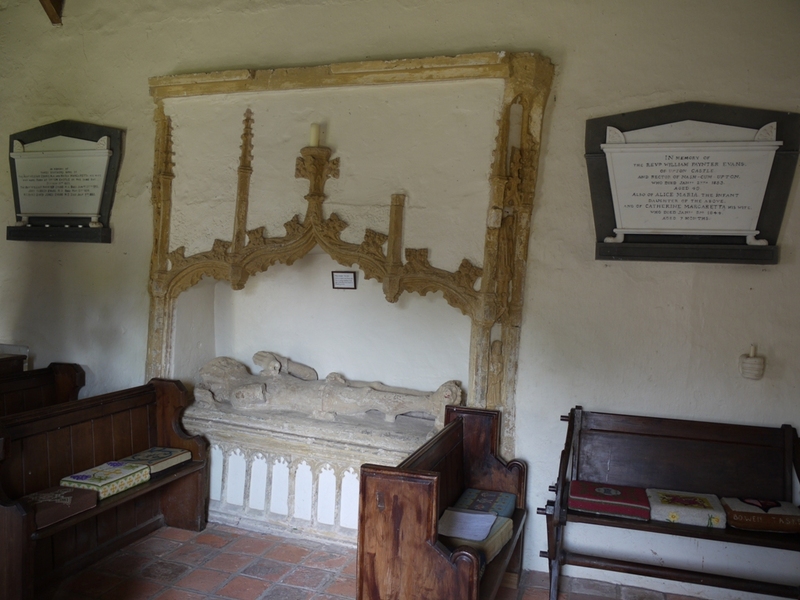 But rarely, multiple births could be successful, and I found the memorial to one such in the tiny private chapel of Upton Castle on the upper reaches of Milford Haven in Pembrokeshire. Upton Castle and its chapel date from the 13th century. The property was sold in 1774 by its ancestral family the Malefants, (who later, by inheritance, became the Bowens). It was purchased by Captain John Tasker a member of the nouveau riche whose huge fortune derived from service to the East India Company in Bombay. On Tasker’s death in 1800 his niece Maria Margaretta Woods inherited Upton Castle. She lived locally with her husband Revd Edward Woods (who was rector of Nash 1796-1801) and their two daughters. 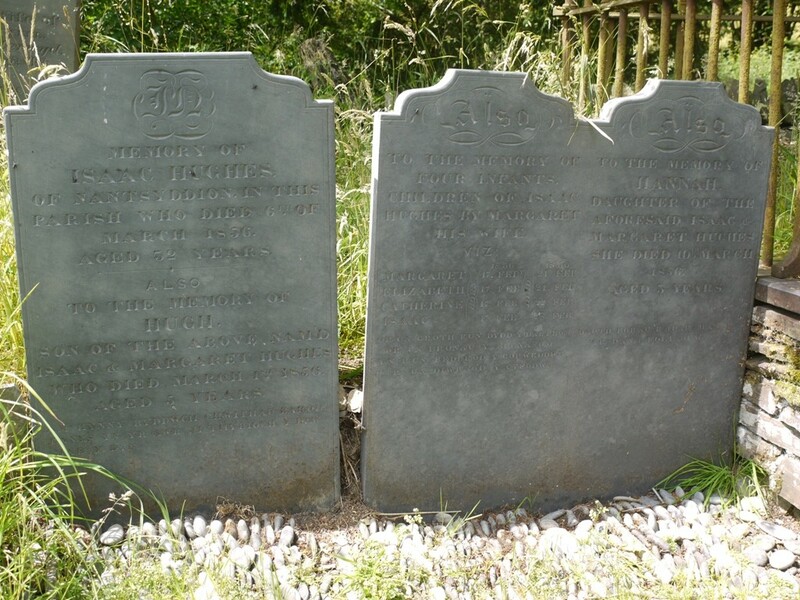 Revd Woods barely appreciated his luck, for he died aged just 43 in 1801 and in 1803 the wealthy young widow was married again, to another clergyman Revd William Evans then aged 41. It is hard to imagine her stress when on 11 October 1803 not one, but three young Evanses were born: William Paynter Evans, John Tasker Evans, and Richard Davies Jones Evans. The event is commemorated in a plaque in the chapel. Maria lived to see her three sons grow to manhood, she died aged 47 in 1822, her triplets now aged 18. In documents following the death of William Evans in 1838 we can find Revd William Paynter Evans, a clerk in holy orders, dwelling at Upton Castle along with his half sister Mary Sophia Woods a spinster ( and heiress through her mother). William Paynter Evans was married, but lacked surviving issue ( his infant daughter died at 7 months of age, and his wife Catherine Margaretta in 1844). * [Actually I learn they also did have a son, Charles Tasker Evans, who lived to adulthood, married, but had no children. See comments from Elizabeth Ann Roberts below]. 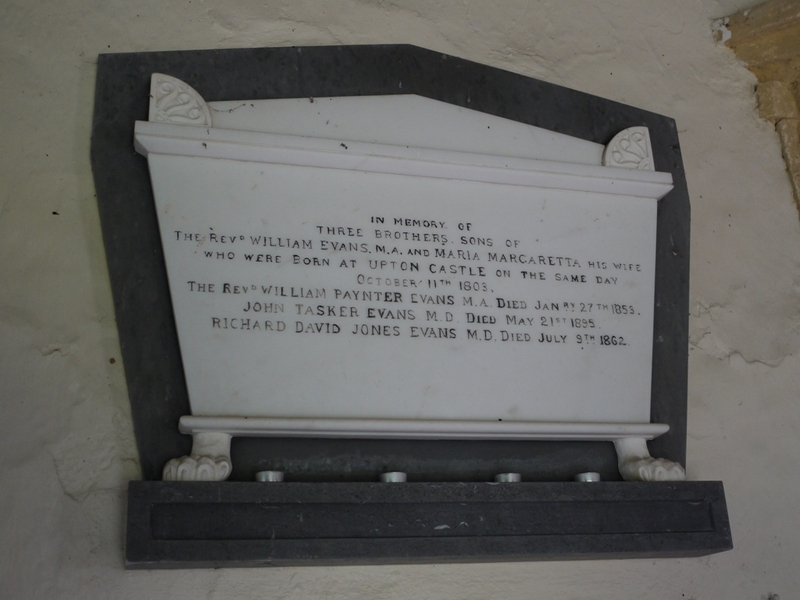 However, when Revd William Paynter Evans died in 1853 his estate passed to his next brother. Both brothers had both become medical doctors and it was the second brother John Tasker Evans (1803-1895) who next inherited, and passed Upton to his son Vice Admiral Richard Evans, (1840-1927) who eventually sold the Upton estate. Clearly their precarious start in life did not hold the three brothers back, living as they did to the ages of 49, 92 and 59 respectively. On either side of the medieval tomb of William Malifant are the memorial to the Evans triplets, and to the eldest, William Paynter Evans and his wife. Unlike the four babies at Ysbyty Cynfryn these triplets were born to a wealthy family with land. It is likely that the Evanses would have been able to co-opt a healthy estate servant with a baby of her own to assist with the feeding, and this may well have been the key to their survival. Indeed the use of wet nurses by Welsh gentry families was widespread. At another Ceredigion mansion, Gogerddan, the reminiscences of Florrie Hamer, (1903-1994) recorded how a recently-delivered mother from the cottages would be checked out by the doctor and then sent up to the big house to feed a new baby. Sometimes the mother would have to abandon her own child to family and cow’s milk in order to accompany the Pryses of Gogerddan to London, to nourish their baby instead. “My grandmother Elizabeth Hamer went into the nursery at Gogerddan to breast feed the baby and my father was handed to his grandparents to be brought up on cows milk. 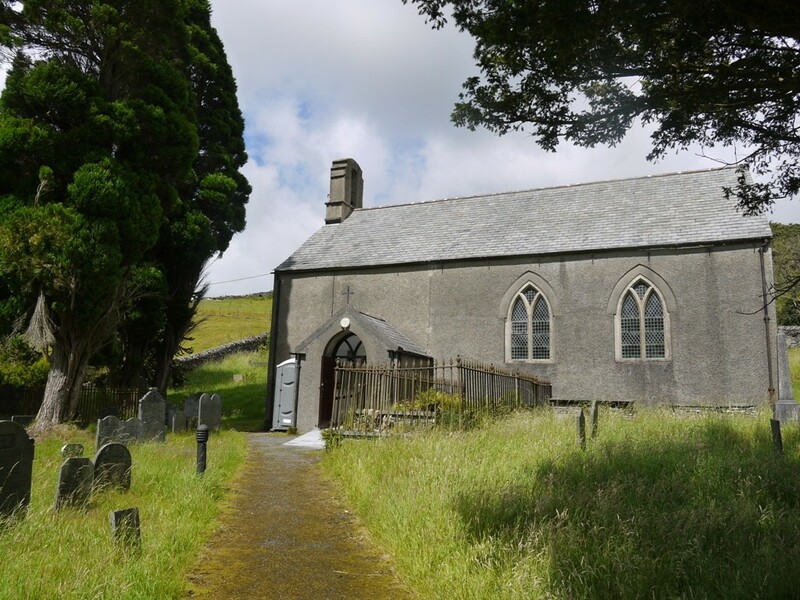 Florence Mary Pryse grew up to be Mrs Loxdale of Castle Hill, Llanilar: the relationship was never forgotten, and when Liza Hamer died in 1925 Florence Mary Loxdale sent a wreath and card addressed “to my Dear Foster Mother”.